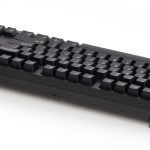 KUL (Keyed Up Labs) ES-87 is our favorite TKL board. Want a solid board? This doesn’t even flex. Want Cherry MX switches? They’ve got it. 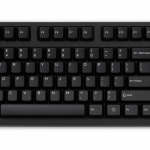 Normal keyboard layout? They are the normalist. Want to swap the top case for different colors? They sell ’em! This keyboard is seriously solid. It’s impossible to flex or twist it. The thing is heavy also, it wont be sliding around your desk. The stock keycaps are ‘ok’, but the caps labels are printed. I swapped them out for JTK White on Black caps, and boy this thing is beautiful. I bought this keyboard originally with Cherry MX Greens, but they were too loud for me. I thought I’d be able to do it, but it just bugged the hell out of my wife. I bought some Gateron switches (they are known to be smoother than Cherry) in the yellow variation. Gateron Yellows are linear switches with a 50 gram spring. 50g is slightly light for me, so I decided to go crazy and grab some 78g springs to see how heavy this would be. 78g springs seem like they would be too much, but I used lube on all the switch springs and switch plunger. Lube creates a smoother and lighter feel for each switch, and with the 78g, it feels like a 70g spring. This has went from a weird little project to my second favorite keyboard, next to my silenced Cooler Master Novatouch.